Hibiscus and mint chai is a sugar free herbal tisane which can be enjoyed as a warm brew or delicious iced tea for those hot summer days. Our brew is a wonderfully refreshing and sugar free, with no artificial sweetener or honey just the natural sweetness from hibiscus flowers. It is a terrific guilt free pick me up for those afternoon energy slumps. The hibiscus flowers add a wonderful sweetness that even kids will enjoy this as an alternative to cordial. 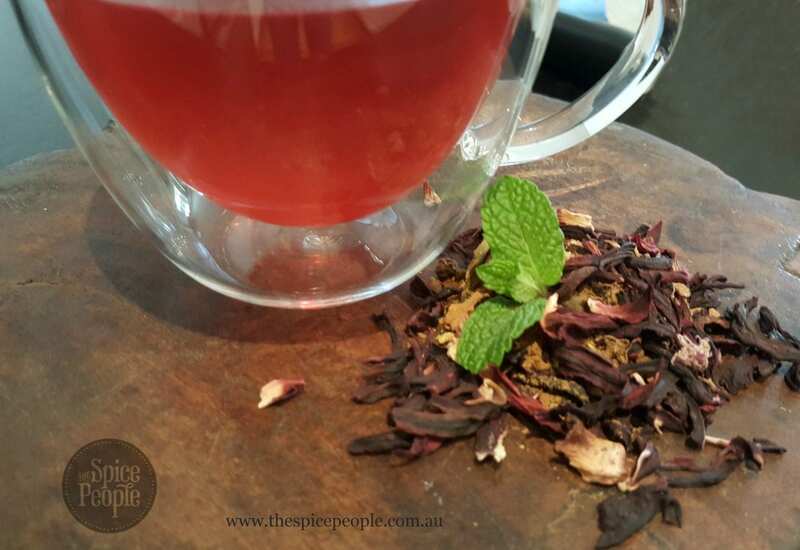 Hibiscus and mint chai is a sugar free herbal tea drink which can be enjoyed as a warm brew or delicious iced tea for those hot summer days. Our brew is wonderfully refreshing and sugar free, with no artificial sweeteners or honey just the natural sweetness from hibiscus flowers. It is a terrific guilt free pick me up for those afternoon energy slumps. The hibiscus flowers add a wonderful sweetness that even kids will enjoy as an alternative to cordial. Whilst adding a great flavor, mint is also fantastic for your digestive system and is perfect for an after dinner drink to settle the stomach. If serving cold strain off the spices and add ice cubes with a piece of fresh lemon, ginger or fresh mint leaves to garnish. 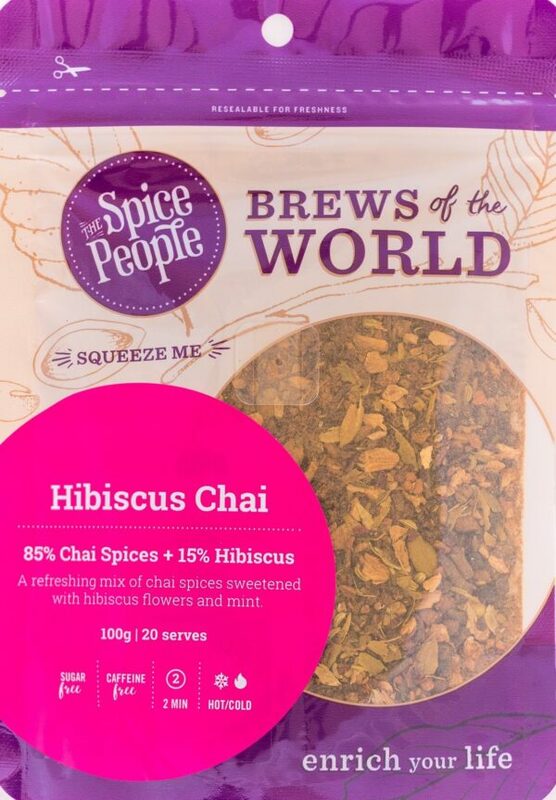 The health benefits of hibiscus chai tea include relief from high blood pressure and high cholesterol, as well as digestive system, immune system, and inflammatory problems. It helps to cure liver disease and reduces the risk of cancer. It can also speed up the metabolism and help in healthy, gradual weight loss. Hibiscus Chai tea is rich in vitamin C, minerals and various antioxidants, while also helping in the treatment of hypertension and anxiety. 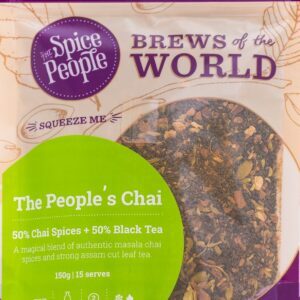 All our chai brews are preservative free, additive free, filler free and contain zero salt. 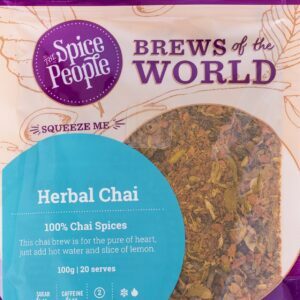 The intense flavour from our spice blends means a little goes a long way. Add 1 teaspoon with hot water and brew for 2 minutes in tea pot with an infuser. Strain and serve. 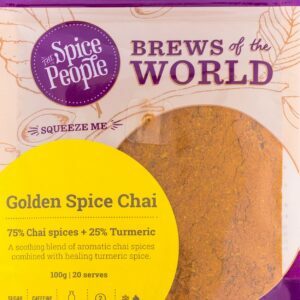 Made from local and imported ingredients including; hibiscus flowers, mint leaves, ginger kibbles and our herbal chai (cloves, cardamom, ginger, pepper, cinnamon, star anise, mace, and fennel) .